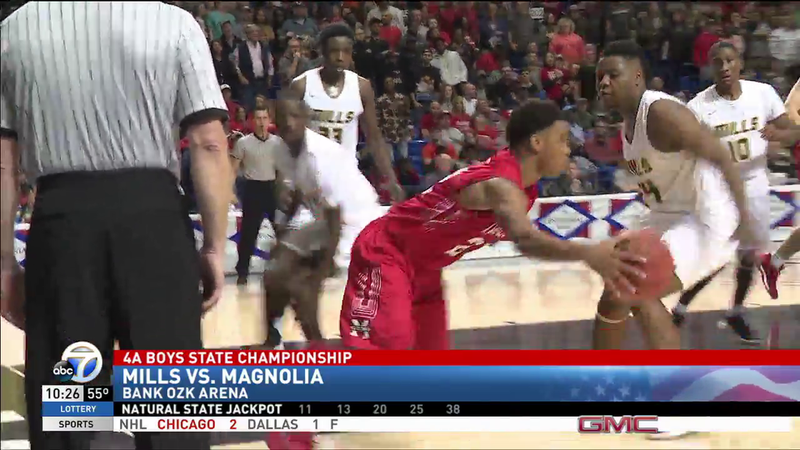 (Hot Springs) - The Mills University Studies Boys Basketball team played in the state basketball championship at OZK Arena in Hot Springs an exciting and close contest. It was the teams' 3rd consecutive year in the state championship. The Comets gave the Magnolia Panthers all they could handle, tying the game at 70-70 at the end of regulation to push the game to overtime. A last-second attempt by Senior Kevin Cross was blocked to give the Panthers the victory with a final score of 78-76. Kevin Cross led The Comets with 24 points. Kiyler Hudson scored 22 points and Orion Virden racked up 20 points, including a clutch 3-point shot in overtime. The Comets end their dominant 2018-2019 run with an impressive 28-5 record. The Head Coach is Raymond Cooper, assisted by Micheal Flowers, Nick Hoffmann and Larell Bailey.